San Diego nonprofits are feeling the benefits of San Diego playing host to last year's California Economic Summit, thanks to grants raised by the event's 2017 Host Committee. The all-star host committee of the 2017 California Economic Summit, led by Jennifer LeSar of LeSar Development Consultants, raised an extra $50,000 to distribute grants to invest in San Diego nonprofits doing good work around workforce development, housing affordability and water sustainability. After careful consideration, five San Diego nonprofits were selected to receive grants. Recipients were awarded grants that ranged from $4,500 to $10,000. Housing YOU Matters coalition is a powerhouse of organizations, broad-based and nonpartisan, focused on finding solutions to the high cost of building housing in the region. They used their $9,000 grant from the Economic Summit to go through a strategic planning process and are in the middle of implementing their strategy. They have moved into the community engagement realm where they are helping citizens at large connect the dots for why we need more housing at all income levels. The Water Conservation Garden in Cuyamaca has six acres of displays that showcase water conservation through a series of beautiful themed gardens, such as a native plant garden and a vegetable garden, as well as how-to displays including mulch and irrigation exhibits. They also offer classes in water-wise gardening, and landscaping. The Garden is expanding its classrooms and is heading into construction phase soon where they will put their $10,000 grant to good use. The Collective Access is an amazing education program that teaches networking to youth. It was developed by a group of young San Diego professionals who wanted to teach and preserve personal connectedness as a tool not to be replaced by technology. The Collective Access used their $4,500 grant for their May 2018 Kid Networking program at Chavez Elementary School where attendees of the after-school program learn the importance of networking, relationship building and professional etiquette. City Heights Coffee House has an interesting business model. They are a nonprofit that serves a cup of joe using a workforce of immigrants who can often be marginalized. The coffee house mentors their employees in professional etiquette and customer service. They also teach conflict resolution and life skills. But, it doesn’t stop there. They work with each person to help them develop a resume and connect them with professional resources and jobs to help them succeed. They are in the middle of a capital campaign to secure a brick-and-mortar space, as they are currently operating in an outdoor tent. The $4,500 grant will help support their new building. 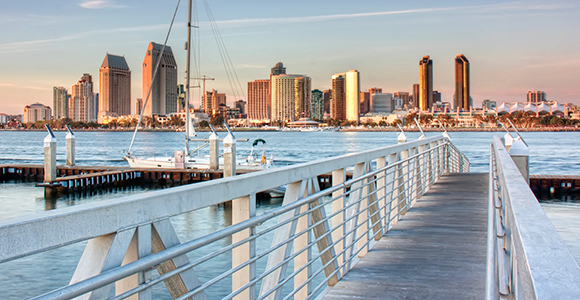 The San Diego Economic Development Corporation Foundation is creating an inclusive economic development strategy around three levels of intervention: Minority competitiveness, Small and Medium Sized Enterprise Dynamism, and affordability. Their $9,000 grant was used to refresh and maintain an indicators dashboard tool based on a model constructed by the Economic Development Corporation, Center for Policy Initiatives and Equinox Center. Members of the 2017 California Economic Summit in San Diego are thrilled that they went the extra fundraising mile so they could support the good work of these organizations that are working towards increasing housing, conserving water and developing our workforce. You can find event and registration information about the 2018 California Economic Summit here. Mary Lydon is executive director of Housing YOU Matters.